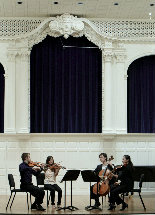 The Yale School of Music will present the next Lunchtime Chamber Music concerts of the year on April 17 and May 8, 2013. Both concerts take place on Wednesdays at 12:30 pm. The midday concerts in this series feature a variety of chamber ensembles, each composed of musicians undertaking graduate study at the Yale School of Music. Faculty violinist Wendy Sharp is the director of the School’s chamber music program. Lunchtime Chamber Music concerts are free and open to the public; no tickets are required. The concerts take place in Morse Recital Hall, located in Sprague Hall at 470 College St., New Haven.